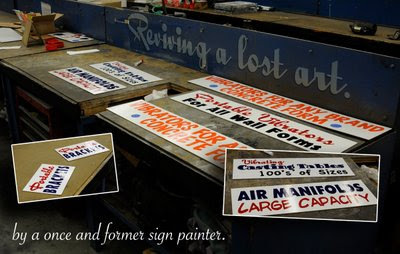 Last week I decided to paint some signs for a trade show we are attending. I did this as a profession from 1971 to 1973. It had been a while since I did any painting. I know I did a sign in 1997 when we decided to go cruising and I did paint the name on the bottom of the dinghy while we were cruising in 1999 but it has been a long time since I did anything like this. Although it was nerve wracking, there was an element of fun and personal satisfaction in the fact that I could still wield a French Quill and One Shot paints (although a bit shakily). Click on the image above to view larger. Ever consider turning some of these into digital fonts?